The following table lists the raster GIS data in the Nang Rong Project's spatial database. Data layers range from satellite gathered imagery, to non-imagery grids relating to landscape and terrain features, to scanned topographic maps. 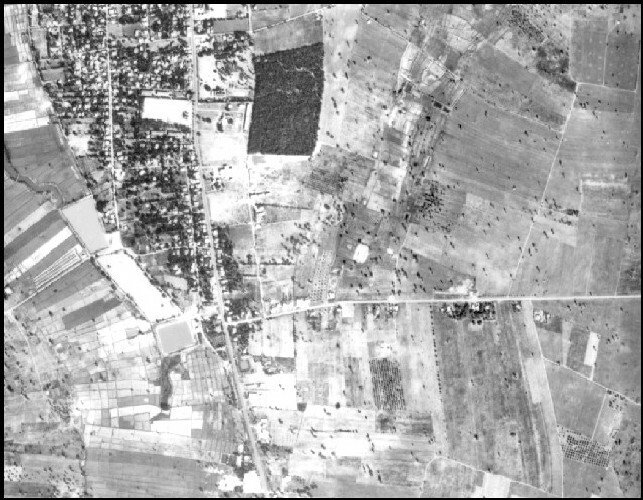 The imagery was acquired and processed in order to render it usable within the database, while scanning and GIS based analyses were utilized in the derivation of other raster datasets. In other instances, existing raster data was acquired, if available. For some of the data, click on the link to view a thumbnail overview. However, since some of the layers contain or depict sensitive locational data, they are confidential, and their use is restricted. IKONOS: Space Imaging's IKONOS sensor collects imagery in 5 bands: 3 visible, 1 near infrared, and 1 panchromatic. The multispectral channels have a spectral resolution of 4 meters, while the panchromatic collects at 1 meter. Combining the multispectral with the panchromatic allows for heightened detail and analysis. The Nang Rong Project has 2 IKONOS scenes, for portions in downtown Bangkok, in its inventory. Digital Raster Graphics (DRGs) Thai Ministry of Defense Maps: A set of 36 1:50000 scale Thai Ministry of Defense maps were scanned, registered, and rectified. Of the 36 maps, 11 of them fall either within the boundary of Nang Rong district, or are adjacent to maps that contain portion of the district. The remaining 25 fall well outside the district, but are useful in providing a broader, regional perspective of Nang Rong. Land Use/Land Cover (LULC) Data LULC Grids: Nearly the entire inventory of Landsat images has been classified into both Land Use and Land Cover types. A hybrid supervised and unsupervised classification approach was utilized, with several post-processing techniques applied to increase accuracy. "Land Use" and "Land Cover" are similar, but differ slightly in their specificity. "Land Use" is more general, describing the broad categories of use, such as rice or field crops, that humans have introduced on the landscape. "Land Cover", however, is more specific, describing the physical cover of the land, independent of a human element. Examples of "Land Cover" are inundated and burned rice, and emergent field crops. Digital Elevation Model (30 meter): The 30 meter elevation model was derived from the 10 meter contour lines that were digitized from the 1:50,000 scale Thai Ministry of Defense maps. This moderate resolution 30 meter DEM has been the basis for a number of derivative datasets, some of which are listed below. Flow Direction: This data layer, derived from the 30 meter DEM, shows the flow direction from each cell to its steepest downslope neighbor. Flow direction is useful for several other analyses, such as watershed modeling and flow accumulation. Landforms: Derived from the 30 meter DEM, this data layer breaks the landscape into 6 distinct terrain classes. The classes are: Alluvial Plain, Lowland Terrace, Middle Terrace, High Terrace, Uplands, and Broken Uplands. Since land use practices in Nang Rong are highly dictated by terrain, this grid is helpful in understanding land use decisions. Slope: Slope was derived from the 30 meter digital elevation model. Agricultural practices in Nang Rong are limited by water resources and terrain. As such, slope helps determine the availablity of usable water and suitable arable land. Wetness Index: A derivitive product of the 30 meter DEM, the Wetness Index combines shape measures of several landscape elements to quantify the availability of water. The Wetness Index incorporates such elements asslope, relative slope postion, aspect, and flow accumulation.